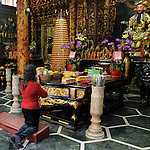 This gallery shows photos taken at a local Taiwanese temple in Kaohsiung City, namely the Bao-jhong Yi-min Temple. This temple is located less than a 5-minute walk from my house, so last weekend I decided to go out and shoot a few images there. It is one of many smaller temples in this metropolitan city, but as soon as you step through the main gate of the temple you leave the hustle and bustle of big-city life behind and enter an abode of tranquility and peace. 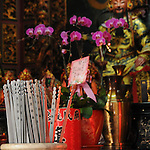 The temple seems to be very much an integral part of the local people's life. 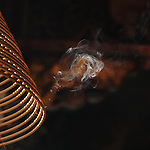 During a one-hour period on a sunny afternoon, about half a dozen locals showed up to make offerings and ask the Taoist gods for advice and blessings. What surprised me most was that no one seemed to be bothered by my intrusion with a camera and just went about their business. The resident temple custodians even offered me tea and home-made candies and gave me a little tour of the temple compound. 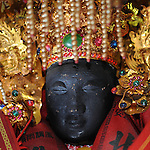 The image descriptions contain some transliterations from Mandarin Chinese, as I would be hard-pressed to find equivalent English terms for a lot of the things inside the temple. I'll try my best to explain them.